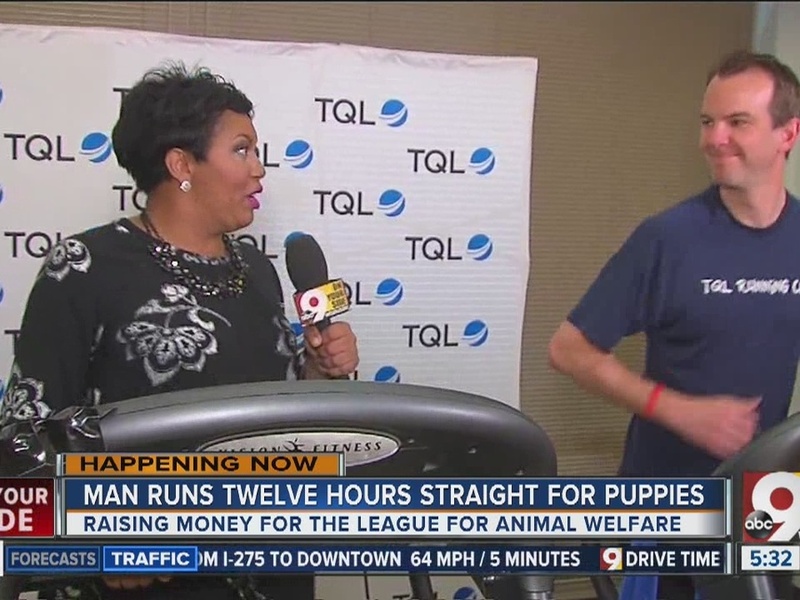 UNION TOWNSHIP, Ohio -- The Flying Pig Marathon may still be a couple weeks off, but a Tri-State man is running his own ultramarathon Thursday to raise money for the Clermont County League of Animal Welfare. Chris McMahon plans to cover about 50 miles by Thursday evening. He kicked off his treadmill marathon at 5:30 a.m. Thursday at the Total Quality Logistics headquarters just off SR 32, and he will keep going until 5:30 p.m. He hopes to raise $5,000 for the Clermont County no-kill shelter through his endurance feat. TQL employees and the general public are invited to sponsor McMahon on a per-mile basis at the website here . You can check in with McMahon through a live stream feed available here after 10 a.m.
As of 6 a.m. Thursday, McMahon was more than halfway to his goal with $2,776 raised. By 10:30 a.m., that figure had risen to $3,802. McMahon says the idea came from another runner he met in a race. At first he thought the idea was crazy, but he decided to do it a couple years later. "You think of anything you possible can other than how far you have to go," McMahon said when asked how he runs such long distances. TQL employees are also participating for prizes based on guesses for how many miles McMahon will complete by noon, 2:30 p.m. and 5:30 p.m. The animal shelter will also be on hand at 5 p.m. for an adopt-a-puppy event for TQL employees.